Park Rite (a Tazbell Services Group company) has operated the Parnell car park for nearing 20 years since it was opened in the late nineties.The car park is a 550 space split level multi storey car park serving the Dublin 1 central retail areas including Henry Street, Mary Street and the ilac centre. 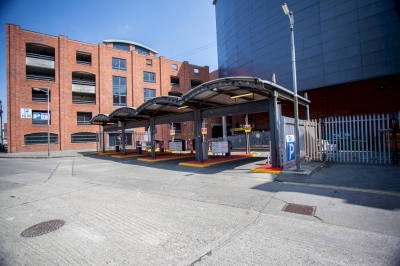 The car park also serves the adjacent cinema, the Rotunda Hospital, the nearby Dublin Institute of Technology (Bolton Street) and local business customers. Under our management, we have invested in new parking equipment systems to optimise its operation and to provide an excellent customer experience. Our teams at the car park are supported from our remote monitoring and control centre located in Dublin who are fully integrated with the onsite CCTV, intercoms and parking systems. Park Rite operated this car park under a management contract for many years and recently entered into a longer-term lease with the new owners of the asset. Park Rite has a track record in operating under both management contracts and under leases. We have extensive experience working with landlords, their agents and new purchasers of car park assets. This enables Park Rite enter into longer term arrangements, investing in the asset and its facilities over the life term of the lease, and ensuring that the value of the asset is maximised. We have extensive experience developing life care plan for these assets include the investment in car park management systems.